Today we will review a super wordpress plugin which every wordpress users must have to secure their site in worst situations . What would happen if your site is hacked and all your database is deleted or If your site is infected by a malware and database deleted or ompromised ? We dont want it to happen with any blogger , but as a blogger you should be prepared for the worst cases . We have found a plugin for this which will do all the work for you ! Super Backup & Clone - Migrate Is a Premium plugin though it is worth its price , because we cant take risk of data loss for anything . Lets have a look of the features provided by the Wp SuperBackUp Plugin . Working with a staging & a production server? We got you covered! WP SuperBackup allows you to easily sync across all files, or just the ones you really need between the servers, in just a few minutes. This all happens automatically based on a schedule you define! Super Backup Wordpress Plugin comes with easy to use options and is a complete package for every wordpress user . You can choose to backup your site to google drive , Wordpress or Amazon S3 . Also Self Diagnosis feature will display your site server details , so that you can make necessary updates before its not too late ! 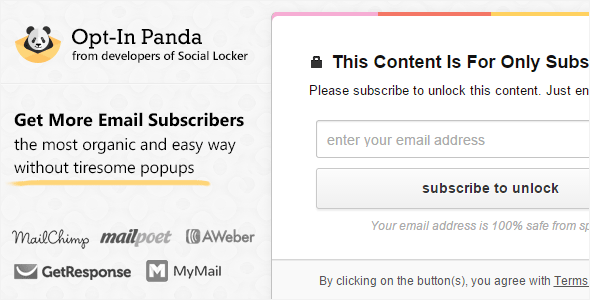 Opt-In Panda is a brand new plugin from the developers of Social Locker Plugin Which we had earlier reviewed on our blog.Opt-In Panda Wordpress Plugin will help you gain more email leads without disturbing your site visitors with popups.This will be best plugin you have ever used , and that too from Social Locker team.Have you ever thought of blocking content from being scraped by content stealers ? Ever wanted to provide exclusive or premium content only for your site users ? Then Opt In Panda is the best choice with easy to customise options and easy setup process. Opt-In Panda works directly with all the major mailing services and plugins: Aweber, MailChimp, GetResponse, MyMail, MailPoet, Acumbamail, Sendy, FreshMail, K-news (and ActiveCampaign, SmartResponder soon). This Plugin also save all your email leads into your database.If Your Email Service is Not supported you can select none as default option to save all your email captures in database from where you can export to your email service. Opt-In Panda also provides Social Login feature through which users can login using social networks liked facebook, twitter , Google Plus and even LinkedIn. Opting to this feature will provide you with more details of your audience interests , helping you to reach out to your visitors with the content they are interested in. 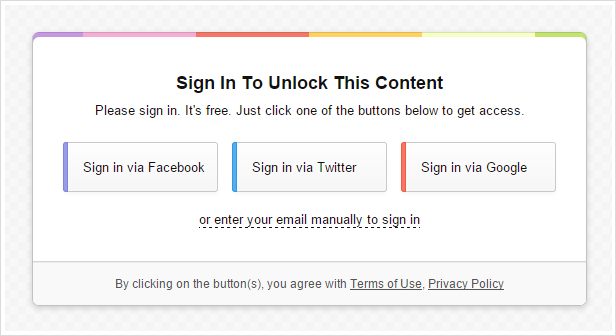 To enable this social login option, you need to set up your social API keys and app IDs for social buttons. Opt-In Locker. A classic subscription form (name/email or only email). 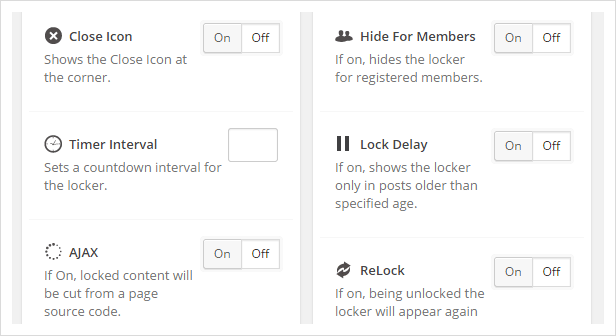 Opt-In Locker with Social Buttons. Sign-In Locker. Only social buttons. Sign-In Locker with Opt-In Form. Opt - In Panda Provide detailed analysis in grapphical data format of your daily and overall leads, Bounces , Channels & Skips. As this plugin supports ajax features, this plugin has advanced features likes timer delay, relock ,Timer Interval and also you can Disable ajax feature. Many Plugins dont work on smartphone and other mobiles , so if you are targetting mobile users this is an optimised for mobile too. As SEO is the most important item for any content to reach to audiences, keeping in mind this plugin is totally seo friendly. That means your content is visible to search engines but hidden for visitors browsing your site. This feature will help search engine index and rank you content when anyone searches for relevent search terms. Many More Features are available with this plugin with the best customizable options. There is nothing in this plugin which is un-customizable. I really love this plugin since the time I Started reveiving it. 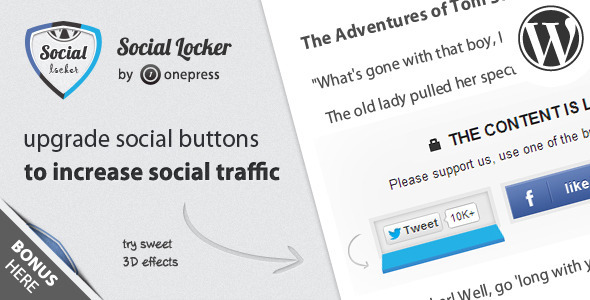 Do you still place social buttons on every page of your website? But visitors don’t like/share your content as often as you would like?You should give people a reason why they need to click social buttons on your website. Even if people really like your content, website or fanpage, they don’t click the buttons because they don’t worry about you, your benefits or your traffic. It’s not their problem. But ask people to “pay” with a Like/Tweet/+1 to get access to your content, to get a discount, to download, to read an ending of your article, to watch a video or to view a funny picture. And it will start to work as it should be!How does it work? 1. Drive Social Traffic: Social Locker will add systematically viral traffic to your website, your opt-in funnel or your sales-page. When users share or tweet your page to get access to the content you locked, their friends see it and some of them visit your website. That repeats again and again. Get every visitor of your site to follow you. Keep in contact with your audience and build loyalty. 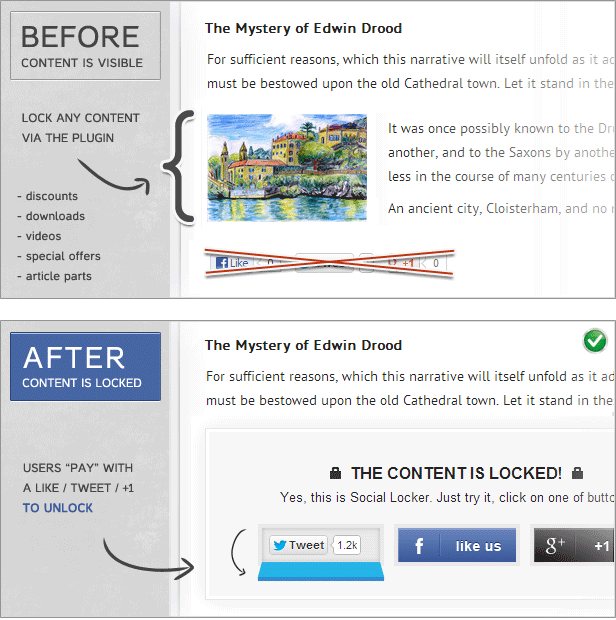 Just lock some valued content and tell visitors that the locked content is available only for your fans and followers. W3 Total cache is the only WordPress Performance Optimization (WPO) framework; designed to improve user experience and page speed. How to Install/Setup W3 Total Cache For Wordpress ? 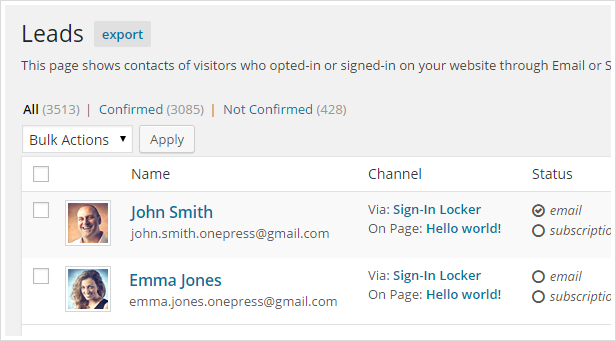 This plugin allows you to create and display signup forms. It fully supports advanced MailChimp functionality like groups and merge fields. This plugin also allows you to set up display conditions – based on them different form may be selected for different sections of your website. Increase your Email Subscription Rate by 210% or more – Quickly and easily with new WordPress Popup Plugin WP Popup Revolution. WP Popup Revolution is equipped with numbers of beautifully designed popup templates that entices your visitors to subscribe in your email list, GUARANTEED! UNLIMITED NEWSLETTER PLUGIN provides a number of convenient options for managing the newsletters. This plugin provides a very easy and nicely integrated with WordPress Backend Interface. A professional Newsletter system for you who don’t like to mess around with lots of confusing settings and have no time to learn new stuff! just install and send emails to your users. This is probably the most basic plugin of all plugins for WordPress newsletters. This plugin will add a newsletter to your blog in just few seconds. It lets you to collect your subscribers on blog and create simple mailing list. You can add unlimited subscribers and unlimited e-mails. And, of course, it’s free. This is another plugin which offers you simple e-mailing of all people who subscribed or commented on your blog. You have the option to send HTML mail to all users registered but great stuff is that you can even send mails to users that commented on your blog. It is simple and with easy installation. You will love it. This plugin supports feature to collect registered users and subscribers into mailing list but it also supports ajax widget, multilanguage and cron batch sending. It allows you to write and send newsletters and to gather e-mails on easy way. Best thing, it is available in more than 20 languages. With WP autoresponder and newsletter plugin you can create mail newsletters, follow up with autorespond and provide subscription with e-mail. You can create unlimited number of newsletters list and create follow up e-mails that can be scheduled to go on exact time or specific time after user had made subscription. It also have many other features, this is absolutely plugin for real professionals. With great Wysija Newsletters plugin you can send your newsletters directly from WordPress on easy and beautiful way. You can drop your posts, images, social icons and other in your newsletter or even change fonts and colors. Simple but yet powerful WordPress newsletter plugin you should have. Often we get asked by our users, is there a way to scan your WordPress site for potentially malicious code? The answer to that question is YES, YES, and YES. There are both free and paid tools available to scan your WordPress site for potentially malicious or unwanted code. It is always good to do a regular checkup of your site by scanning it for potentially malicious code. In this article, we will show you a few ways on how to scan your WordPress site for potentially malicious code. Often hackers target themes to inject links, so this plugin is a good way of checking for that.